Special-bodied Jupiters were raced and rallied and played their part in making motoring (not just Jowett) history. A reader writes: Hello Ed, Book has arrived THANKS it is magnificent!! A virtuoso performance indeed. Another reader wrote: This book is a wonderful addition to my library – an obvious labour of love. Thanks for your dedication to recording automotive history! And "This book is for anybody with an interest in classic cars, not just Jowett... I have read my copy twice and still pick it up!" 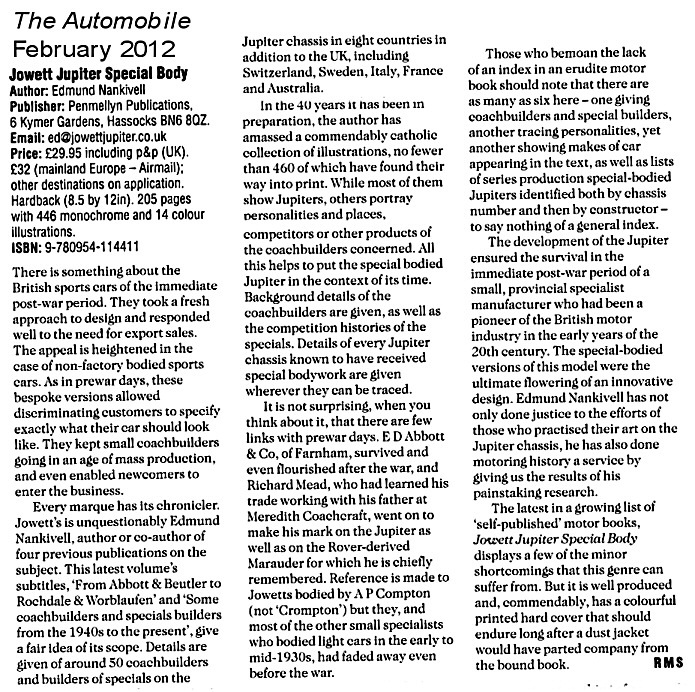 There is a superb review in The Automobile <<click to view, of February 2012. 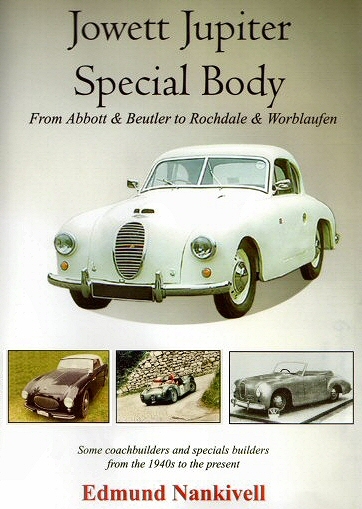 And a reader writes: "I bought this book NOT because of a particular interest in Jowetts BUT because it provides a lot of unusual information on specialist British car body builders, information which is otherwise sparse. BUT reading it I was convinced of the value of Jowett and this book is a tribute to the research and information accumulated by the author over the years. I found it fascinating. Well done indeed!" Within the book's 205 pages are 11 chapters, 446 monochrome and 14 colour illustrations. (full history in “The Fate of the Sleeping Beauties” published by Veloce) who exhibited it in unrestored condition, in his museum depicting barn-find cars cars. Where the fate of a car is known, that has been researched. I am sure the author did not set out to write a book about little known, mainly British, coachbuilders, but that is what he has achieved. He has given the history of the firms that bodied these cars, in many cases the first time such details have been published. He often goes into detail on some of the other cars (or commercial vehicles or in one case a Flying Flea aircraft) for which these companies had built the coachwork. In this reviewers opinion one of the most attractive Jupiter bodies was designed by Frank Grounds Ltd of Birmingham (established in 1894) for his own use and that of his wife Lola. Registered LOL1 . It was built for rallying, and conformed to the Monte Carlo Rally rules on special bodied 4 seat saloon coachwork for 1953, the year in which it competed in the event. The crew were Frank Grounds, Ken Rawlings and Jack Hay. The car came up for auction in 1990 and then again in 2000 “Restoration has continued in fits and starts”. It is surprising how many of the cars in this book are extant, but in many cases have been in one ownership being under restoration for a very long time! A real labour of love and very readable too. It would be easy to think that this book would only interest those with a liking for the Jupiter. WRONG! This book is for anybody with an interest in Classic Cars, not just Jowett...Edmund has ceratinly done his research...I found it absolutely fascinating reading about the origins of each company and how they came to be involved with this rather intriguing new sports car chassis from Jowett. I have read my copy from cover to cover twice, and can still pick it up and enjoy it. 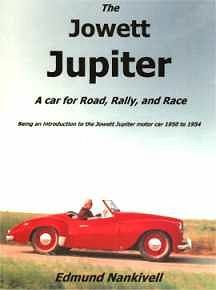 "...comprehensive account of Jupiter development, well written...well-written stories on every chassis built...masses of pictures and details...interest is added by including pictures of similar work by the builders...Ed weaves all this together in way that makes it hard to put the book down...a fascinating and a good read..."
Classic Car magazine (October 2012) said "Self-publishing comes in to its own with books like this. Jowett enthusiast Edmund Nankivell's fifth work focuses on the rare coachbuilt specials based on [the Eberhorst] sporting chassis...a remarkable if individualistic book"
Please contact if you are interested in purchasing this book by Edmund Nankivell. 80 pages. 66 monochrome and 7 colour illustrations. Foreword by Gordon Wilkins. The eye-catching Jowett Jupiter burst onto the motoring scene in 1950 and was an instant success in national and international competition. It was Jowett's last, most expensive and fastest model, and the book relates in an entertaining, readable and informative way its remarkable sporting and other achievements and history from 50 years ago up to today. The book has a foreword by Gordon Wilkins who has been a motoring journalist for more years than he would like to be reminded of (including writing for both British magazines Motor and The Autocar) and who has taken part in the Le Mans 24-Hour race and the Monte Carlo Rally many times. "I am writing to say how much I enjoyed the book - its freshness, crisp and humourous prose, the anecdotes, good illustrations, the format and not least the excellent proof-reading". Thanks, Michael Walsh. Classic and Sports Car says: "All aspects of this individualistic 1950s sports car are covered...slim but comprehensive history...special coachwork, film appearances and a wealth of intriguing facts...an accessible and fun production...". As Malcolm Thorne (Reference Librarian, National Motor Museum at the UK's Beaulieu), said to me "it makes a very welcome change from the usual titles on MG, Triumph and Jaguar". 10b Doman Road, Camberley, Surrey, GU15 3DF England. Chater's price is now �4.99. 33 St. Martins Court, London WC2N 4AN England. You can telephone Motor Books on +44 (0)20 7836 5376. You can buy the book direct from the author by calling 01273-843457. UK price now only �5.00 (sorry no plastic) including post and packing. "The Jowett Jupiter - the Car that Leaped to Fame"